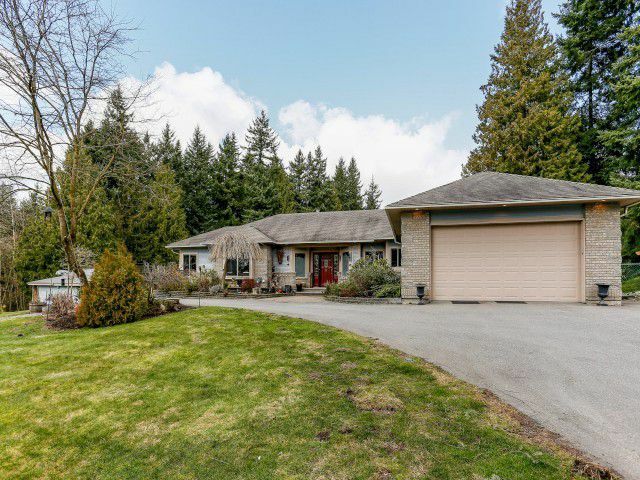 Tranquil highly sought after 5 acre horse/hobby farm 40 mins From Vancouver in County line Glenn Valley, boasts an oasis garden park like setting. Near Gloucester estates with your own private exclusive pond. The secured gates leading to a winding driveway leading to a charming Jenish 4516 sqft 17 yr young 2x6 rancher full walk out bsmt, built by current owners. The spacious home includes 9ft Ceilings, 6 bedrooms, 6 bathrooms, 3 kitchens ideal for those large families. Features include beautiful kitchen, granite counters, stainless high end gourmet appliances. Large master bed with walk-in 5 piece fabulous bathrom. Large living room with big bright family room vaulted ceilings and full bar overlooking a private scenic pond with luxury living in nature itself. The bsmt. features bright concept with large recroom for extended families. Down master bedroom has ensuite/walk-in closet and gas floor to ceiling fireplace in living room with in floor heat. Private patio, all wheelchair accessible. Call now for a view.